The old name was Koeta Radja, nowadays Bandah Aceh. At first an old building in the Kraton served as hospital facility, but in 1876 it was removed to the opposite side of the Atjeh river (See Grote Atlas NOI, 78). 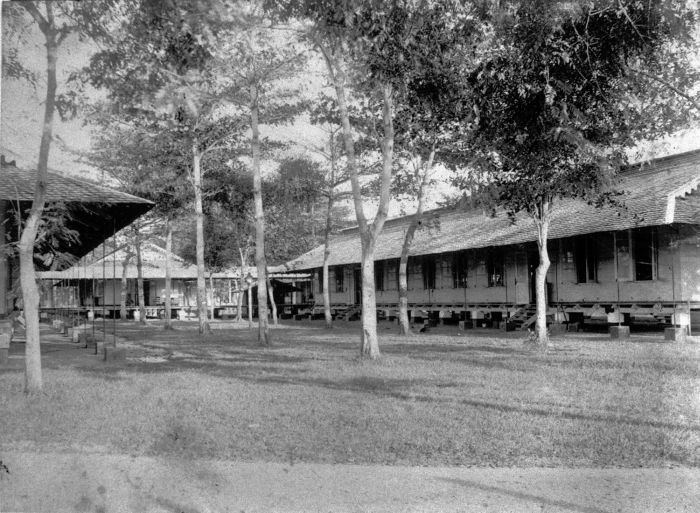 This temporary hospital was built with primitive materials and was composed of bamboo barracks. In 1879 the permanent hospital was ready. It was opened in 1880, when a tremendous bandjir made the prolonged stay in the old building impossible. The complex existed of 26 wards with each 40 beds (totalling more than 800 beds). Its place of establishment was called Panteh Perah. Its location created sometimes problems, as the river sometimes entered the terrein and flooded the buildings. In 1894 a second female ward was completed and in 1895 an X-ray apparatus is available to support the diagnosis and location of bullets and other corpori alieni in the patients body. The survey of military hospitals in 1904 (Encyclopaedie voor Nederlandsch-Indie, 833) mentioned three 1st class military hospitals: Weltevreden, Tjimahi and Kota Radja. The last one was considered to be a large modern hospital of 800 beds. In 1904 there were 29 permanent military hospitals and 41 infirmaries (See H. den Hertog, De militair-geneeskundige verzorging in Atjeh 1873-1904, dissertation Nijmegen 1991). Many years later,in 1940, a report is made of the voyage of the Governor-General Esquire A.W.L.Tjarda van Starkenborg Stachouwer who visits Sumatra from the 4th of March 1940 to the 27th of March 1940 and pays also a visit to the Military Hospital of Koetaradja on Monday 11 March 1940. Superintendant of the military hospital is then the Officer of Health 1st class W.F. Nelissen. Kota Radja was in the 1930s a subdivison of the Division Groot-Atjeh, Government Atjeh and Dependencies. The capital with the same name is at the same time divisional and regional capital. The subdivision is administratively ruled by a Controleur and has 27,000 inhabitants, of whom 1,200 Europeans and 3,700 Chinese (Gonggryp 1934, 666).